Posted December 11, 2015 by Heather Michet & filed under Natural World, Plug In to Nature. One of my favorite hashtags is #NatureAmazesMe. Earthgirl that I am, it doesn’t take much to thrill me and turn on my wonder button when I’m out tromping in the woods, or even my backyard. 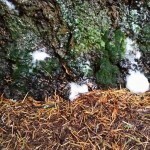 A perfect example showed up yesterday as I finished up my morning ritual and spied these clusters of foam at the base of one of my Douglas Fir trees. I use no chemicals on or around my trees – or anywhere else, for that matter – so it wasn’t a human made chemical reaction taking place. Since I had no clue as to what was causing this, I posted the photo on Facebook and whether anyone knew what the heck was going on with this. One of my readers found the answer on this site. So there we have it: another natural wonder solved, or at least hypothetically solved. Unplug from the gadgets, get outside and look around. I’m betting your wonder buttons will get pushed too. And you will feel better. That is so cool! Foamy trees.